xiii, 291 leaves : ill. ; 29 cm. Thesis (Ph.D.)--University of Florida, 1999. Includes bibliographical references (leaves 264-290). of a humble personality behind a powerful mind. I am also indebted to Dr. Prem Subramaniam, Dr. Lokenga Badinga, Dr.
Rosalia Simmen, Dr. Naser Chegini, Dr. Joel Yelich, Dr. Maarten Drost, Dr.
their sincere friendship and scientific support. de la Sota, Dr. Divakar Ambrose, Dr. Joan Burke, Dr. Maria de Fatima Pires, Dr.
Andrew Majewski, Inseok Kwak, Jason Blum, Max Huidsen, Tomas Belloso, Dr.
Kowalski, Dr. Karen Reed, Dr. Michael Green, Michael Porter and Andy Kouba. contributions will not be forgotten. Veterinary Medicine and the Meat's Laboratory crew. Molecular and Cell Biology program during the first year of my graduate studies. Stacey Chestain, Joe Sadek and Jackie Wilson . me on this long road. Electrophoretic Mobility Shift Assays .................... 196.
pregnancy for maintenance of the corpus luteum (CL) were studied in cattle. on prostaglandin F,(PGF,) production by bovine endometrial (BEND) cells. transducer and activator of transcription (STAT) pathway of signal transduction. protein expression and enzymatic activity measured through IB and RIA. conceptus crosstalk required for successful reproductive outcome. source of nutrients for humans. necessary to improve conception rates in cattle. from other species will be presented whenever appropriate. maternal gametes interact with somatic cells in maternal reproductive tissues. differentiation of the supporting cells that are in direct communication with them. is abrogated by presence of the oocyte (Eppig et al., 1997b). namely infundibulum (INF), ampulla (AMP) and isthmus (IST; Hafez, 1993a). "picks up" the ovulated oocyte and initiates its transport towards the uterus. Overall flow of oviductal fluid is towards the body cavity (Hafez, 1993a). (AMP), it must interact with ciliated epithelial cells lining the oviductal lumen. POSP in sheep, increased blastocyst formation after in vitro fertilization. including a POSP-like protein that are associated with bovine oocytes in vitro. sustained sperm mobility in vitro (Parrish et al., 1989; McNutt and Killian, 1991). factor (oviductin) that acts to enhance sperm penetration in follicular oocytes. and secretion of interleukin-1 p both in oviduct and uterus of cyclic cows. 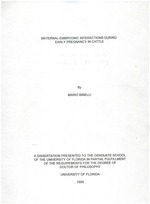 before day 5, which suggests a oviductal effect (Paula-Lopes et al., 1998). maintenance of CL and consequent sustained elevated P4 concentrations. embryonic survival by attenuating luteolytic mechanisms (Thatcher et al., 1994b). reported up to 93% survival rates to day 8, 66% to day 16 and 58% to day 42.
aimed to attenuate fertility problems in the field. fertilization or early cleavage stages (King, 1985). heat stress increased the proportion of abnormal embryos compared to controls. optimal for fertilization and embryo development, resulting in abnormal embryos. required for maintenance of an environment conducive to pregnancy. heat stress favors luteolysis and consequent loss of pregnancies. quality CL (i.e., low weight and consequent low P4 secretion) and (2) insufficient . of P4 but yielded mixed results on pregnancy rates. and consequent loss of pregnancy to occur. communications. One widespread practice is synchronization of estrous cycles. which could affect early embryonic development and decrease fertility. experienced by cows developing persistent follicles. are described below in the sub-sections "Functional anatomy and morphology"
blastocyst stage 24 h before the others and also had significantly more cells. characteristics are necessary for best embryo development. ovulatory follicle prior to ovulation only occurs in a low P4 environment. coats: an external longitudinal and an internal circular coat (Leese, 1988). accumulation of granules in non-ciliated cells of the AMP (Murray, 1995). (Kouba et al., 1997) and bovine oviductal glycoprotein (Boyce et al., 1990)]. conducive to reproductive failure (Binelli et al., 1999, Chapter 3). periestrus stage of the estrous cycle. conditioned medium and inactivating proteins before incubation with sperm. of sperm/egg binding or embryonic development by oviduct-derived proteins. al., 1992; Buhi et al., 1996; 28, DeSouza and Murray, 1995; Murray, 1993). did not indicate changes in patterns of de novo synthesized, secretary proteins. influenced embryo development in that species. dependent on the E2/P4 ratio; and (4) hydrodynamic properties of luminal fluids. Changes in these factors are modulated by concentrations of ovarian steroids. the mechanisms of egg pick up and fertilization. problem of embryonic mortality during this period. conditions the uterine environment, to support embryonic development. secretary activity are modulated by ovarian steroids, as discussed below. part of the uterus (consisting of uterine horns and uterine body), and the cervix. progesterone levels rise as the estrous cycle progresses (Hafez, 1993a). measured changes in PGF2,concentrations in response to a challenge with E2. whether bovine acid phosphatase has the same role in cattle is unknown. of IGF-1, IGF-binding protein (IGFBP)-2 and 3 and GH receptor in the uterus. exert regulatory functions that influence both the concepts and the uterus. pregnancy related to CL maintenance occurring in the pregnant uterus. the uterine cycle is not interrupted. PGFM peak for both heifers. oxytocin receptor antagonist (CAP-527) failed to block normal luteolysis in cows. pathways stimulated by LH with the PGF2, secretary machinery. act in concert with oxytocin to stimulate luteolysis. progesterone is required for the uterus to acquire responsiveness to oxytocin. oxytocin injection, but no increase was noticed in animals that did not receive P4. and as a result, the uterus becomes responsive to the luteolytic stimulus. COX-2 (Raw et al., 1988). that pregnancy was only maintained if embryos were transferred prior to day 17.
were removed on day 17 vs. day 15 of pregnancy (Northey and French, 1980). production of E2 per follicle (decreased aromatase activity; Thatcher et al., 1991). attenuates E2 effects (Thatcher et al., 1984). found in the endometrium of cows (Basu and Kindahl, 1987; Gross et al, 1988). activity and thereby decrease PGF2, production. endometrium between cyclic and pregnant cows. 6.8 (Helmer et al., 1987; Anthony et al., 1988). infused with recombinant blFN-r compared to controls (Meyer et al., 1995). estrous cycle in presence of oxytocin or a combination of oxytocin and bIFN-r.
only significant when extremely high doses of blFN-r (20 ~gg/ml) were used. maximally stimulated COX-2 mRNA and protein from 3 to 24 hours compared to "
expression of COX-2, which would contradict the antiluteolytic role of blFN-r.
to characterize association of iodinated ovine IFN-r to membrane peptides. They identified binding of IFN-T to both 100 and 70 kD membrane polypeptides. transducer and activation of transcription, or STAT, proteins to close contact. Figure 2-1. The JAK-STAT pathway of signal transduction and gene activation. which stimulate synthesis of IFN-inducible genes. describe evidence for existence of this pathway in the bovine endometrium. which was later identified as a particular chain of the interferon receptor complex. conducted in bovine reproductive tissue, to test signaling ability of blFN-r.
specific receptor chain remains elusive. IFNaR1 and to tyk-2 to reciprocally coimmunoprecipitate both proteins. interferon brings IFNaR2 and IFNaRI, which contains tyk-2, together. of interferon-gamma receptor from STAT-1 to STAT-3. antisense become less sensitive to the antiproliferative effect of interferons. IRS-2 molecules associate with IFNaR1 and become phosphorylated by tyk-2. antiluteolytic roles of bIFN-r in the endometrium. sequence homology with the catalytic domains of other protein tyrosine kinases. receptor chains, which serve as docking sites for STATs, as mentioned above. receptors than by specific JAKs associated with receptor chains. tyrosine (Y) phosphorylation is also represented. reciprocal binding of tyrosine phosphorylated residues with SH2 domains. phosphotyrosine motifs on JAK kinases. extracts obtained with high-salt, detergent-containing buffers. propose that following dimerization, STAT complexes translocate to the nucleus. translocation of a peptide containing the carboxy-domain of the IFNy molecule. transfection to STAT-deficient U3a cells, this "conditionally active STAT"
maintained, such as activation by receptor, dimerization and DNA binding. mechanism. However, existence of both mechanisms is feasible in vivo. sequences are known as interferon-stimulus response elements (ISREs). contact DNA, while STAT-1 stabilizes the complex by contacting DNA directly. phosphorylation of the interleukin-3 (IL-3) receptor and STAT-5, after stimulation. the regulation of the JAK-STAT pathway was reviewed by Starr and Hilton (1999). proteins such as SOCS1 bind directly to JAKs to inhibit their catalytic activities. Another protein, CIS, binds to activated receptors to prevent docking of STATs. 3:3, STAT-1:3 dimers. Binding of STAT-1 homodimers was not affected. luciferase activity from an IRF-1 reporter gene with increasing amounts of PIAS3. cellular pathways, which will be discussed next. by growth factors, while STAT-1 was poor substrate for several MAPK tested. the autophosphorylation domains were also effective in phosphorylating STATs. response to IFN-y within 30 minutes of infection (Lee and Rikihisa, 1998). Also, . kinase probably is not required for interferon effects. presented in Chapters 4, 5 and 6.
complexes containing ubiquitin, indicating a blFN-T-induced, specific action. secretion in the pregnant uterus. survive. The maternal unit should provide a quiescent and nutritive environment,. PGF,2 synthetic pathway (arrows with [-] signs; see text for details and abbreviations). inhibit the default, PGF2,-secretory pathway of the uterus. Thatcher and Hansen. (1992) reported that day 17 conceptuses varied in size from 15 to 250 mm. signaling mechanisms within the endometrium or a combination of these factors. had a much attenuated secretion of PGFM in response to an oxytocin challenge. and subtropical latitudes, warrant investigation and application. prostaglandin F2a (PGF2,), progestins and GnRH (Thatcher et al., 1996). measured by conception rate at first service (number of pregnancies / number of . synthesis and secretion may affect conception rate. (Chicago, IL). Donations of Lutalyse were made by Pharmacia-Upjohn Co.
standards were purchased from Sigma Chemical Co. (St. Louis, MO). Spectra/por 3 dialysis membrane was from Spectrum Medical Industries Inc.
(Hercules, CA). Glycine was from ICN Pharmaceuticals, Inc. (Costa Mesa, CA). mg/l), methionine (13.5 mg/I) and antimycotic-antibiotic solution (10 mill). Figure 3-1. Experimental protocol (see text). 1993b; Schmitt et al., 1996c). and 290 mg) were used. 1 M Na salicylate solution, dried and exposed to x-ray film for 35 days at -800C. General Linear Models of Statistical Analysis System (SAS, 1988). indicated. Day 0 represents day of estrus at the beginning of Treatment Period. size of 22 mm by day 16.
dominant follicle (PDF, not treated with GnRH on d 9) during the Treatment Period. a) estradiol-17p (E2); b) progesterone (P4).